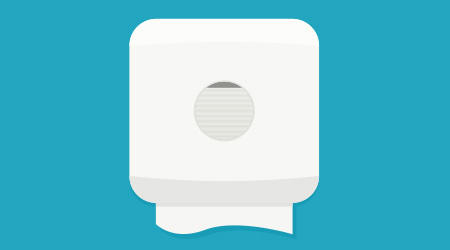 This is the second part of a three-part article about ADA-compliant hand dryers. In addition to smaller and mightier motors in ADA-complaint hand dryers, these newer units offer all the bells and whistles of traditional machines. The newest wall-mounted ADA-compliant dryers include adjustable potentiometers that can control motor speed and sensor sensitivity. There are machines that include tamper-proof screws, thermal cutoff switches, vibration dampeners and automatic timers that shut off the unit if an inanimate object is placed in front of the sensor. “In the past 10 years, there has been more advancements in hand dryer technology than in the previous 80-plus years of their existence,” says Andrew Hansen, new business development manager for Palmer Fixture Company in Green Bay, Wisconsin. Often, compliant dryers cost the same as the larger traditional models. Plus, they don’t require the purchase of a recessed kit and the associated labor for in-wall installation. As with most products, performance among ADA-compliant hand dryers can vary significantly from one manufacturer to another. Some models offer longer dry times, higher energy burn, fewer features or substantially higher price tags than traditional dryers. On some models, the outlet nozzle sits too close to the wall. This causes a user’s hands to touch the wall during use, which can create a negative customer experience. An answer to this problem has been to angle the nozzle away from the wall, but this creates another problem because it directs the moisture onto the user, says Jim Fisher, vice president of sales and marketing for American Dryer in Livonia, Michigan. Distributors should avoid potential problems by asking colleagues for recommendations, testing several models and reading product reviews before purchasing. “It is best to review third-party testing on the dryer models before making a purchasing decision,” says Gagnon. Most ADA-compliant dryers are simply slimmed-down versions of traditional models. One notable exception, however, are washbasin dryers. This newest style of dryer is incorporated into the hand-washing station, which also includes the faucet and soap dispenser.